The dress-up game with an edge. Let's get ready to Rock!!! The concert is about to start and the rock stars are throwing a fit! They are not ready yet and it's YOUR job as the designer to dress them up. If they don't like what they see, they are likely to throw a tantrum and storm off!Get a rocker dressed for a night out. This guy is rock! You have only 30 seconds to make up and dress up this rock boy, click on the head to make up, click on his hands and neck to change the accessories, click on the tatoos to give him one. Point and click on the mouse button to dress up that particular part of the body. To use an item of Clothing, click on it. For accessories, click on that particular part of the body. For example, for earrings, click on the ears. For makeup and hairstyle, click on the Face. Get the Rock Star dressed before your time runs out. If you want to play Dress To Rock games online you have come to the right place! 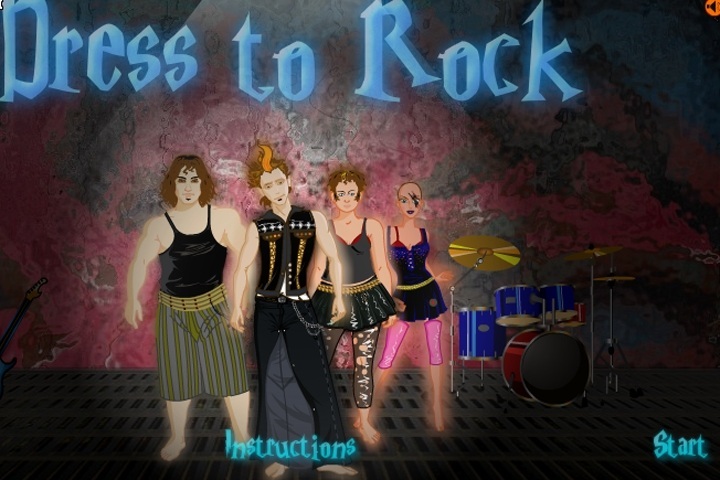 GamesLoon adds new Dress To Rock games every week. This is your game portal where you can find the biggest collection of free Dress To Rock games online. Do not forget to rate our Dress To Rock free online games while playing!